The goal of the present study was to evaluate the reproducibility of cerebral adenosine A2A receptor (A2AR) quantification using 11C-TMSX and PET in a test-retest study. Five healthy volunteers were studied twice. The test-retest variability was assessed for distribution volume (VT) and binding potential relative to non-displaceable uptake (BPND) based on either metabolite-corrected arterial blood sampling or a reference region. The cerebral cortex and centrum semiovale were used as candidate reference regions. Test-retest variability of VT was good in all regions (6% to 13%). In the putamen, BPND using the centrum semiovale displayed a lower test-retest variability (3%) than that of BPND using the cerebral cortex as a reference region (5%). The noninvasive method showed a higher or similar level of test-retest reproducibility compared to the invasive method. Binding reproducibility is sufficient to use 11C-TMSX as a tool to measure the change in A2AR in the human brain. The regional cerebral binding of adenosine A2A receptor (A2AR) antagonists, [7-methyl-11C]-(E)-8-(3,4,5-trimethoxystyryl)-1,3,7-trimethylxanthine (11C-TMSX)  and 11C-KW-6002 ,, were quantitatively investigated in vivo in healthy human. 11C-TMSX has been evaluated in human brain studies in not only healthy human controls - but also in drug-naïve Parkinson's disease patients before and after therapy . An aging effect on A2AR was also evaluated using 11C-TMSX PET . Several outcome measures, such as distribution volume (VT), distribution volume ratio (DVR), and binding potential (BPND), can be used to detect changes of A2AR binding due to disease progression or therapeutic treatment. The reproducibility of these measures is important to conduct studies to detect change in A2AR. Given that A2AR distribution is heterogeneous, with only a very small amount of extrastriatal-specific binding, either the frontal cortex in the rat , the cerebellum in the monkey ,, or centrum semiovale  or cerebral cortex , in human, was used as a reference region to estimate non-displaceable binding of 11C-TMSX. Since only a few postmortem human brain studies and blocking studies are available, it is not clear which region is a suitable reference region. The aim of this paper was to assess the test-retest reproducibility of PET outcome measures, VT and BPND, with the centrum semiovale and cerebral cortex as candidate reference regions. All studies were performed under a protocol approved by the Ethics Committee of the Tokyo Metropolitan Institute of Gerontology. Five healthy, male subjects participated in this study (mean age ± SD, 22.4 ± 2.6 years old, range: 21 to 27 years old). Subjects were all right-handed and screened for history of neurological, psychiatric, and physical diseases. All subjects did not have a history of alcoholism and not on any medications to affect brain function. Caffeine intake was not allowed for at least 12 h prior to PET scanning. Written informed consent was obtained from all subjects after receiving an explanation of the study. Magnetic resonance (MR) images were acquired on all subjects to eliminate those with any brain abnormalities and to place regions of interest (ROIs) on PET images. The MR imaging was conducted with three-dimensional spoiled gradient-recalled echo (SPGR) imaging on a SIGNA 1.5 Tesla machine (General Electric, Waukesha, WI, USA) . Radiosynthesis of 11C-TMSX followed the literature procedure . All procedures were conducted under dim light to prevent photoisomerization of 11C-TMSX. The radiochemical purity of 11C-TMSX was >99%. Each subject underwent two 11C-TMSX brain PET scans on two different days, and time of scanning was identical for test and retest scans of each individual subject, in order to remove the influence of circadian rhythm. The inter-scan interval was 28 to 35 days. Dynamic PET images were acquired in the Positron Medical Center, Tokyo Metropolitan Institute of Gerontology with the SET-2400 W PET scanner (Shimadzu, Kyoto, Japan), which acquires 63 slices (3.125-mm slice separation) with a spatial resolution of 4.4 mm full width at half maximum (FWHM) and a z-axis resolution of 6.5 mm FWHM . Prior to the scan, a 5-min 68Ga/68Ge transmission scan was conducted for attenuation correction. 11C-TMSX was injected intravenously over 60 s. Emission data were collected in two-dimensional mode for 1 h in 27 frames of increasing duration (6 × 10 s; 3 × 30 s; 5 × 1 min; 5 × 2.5 min; 8 × 5 min). Head movement was minimized with an air cushion. The dynamic images were reconstructed by the filtered back-projection method using a Butterworth filter (second-order low-pass filter, cutoff frequency was 1.25 cycles/cm) with corrections for scatter and randoms. In advance of each scan, an arterial catheter was inserted into the radial artery for blood sampling. After radiotracer injection, arterial blood samples were manually collected every 10 s for the first 2 min and thereafter at longer intervals, 2.25, 2.5, 3, 5, 7, 10, 15, 20, 30, 40, 50, and 60 min post-injection. A total of 24 samples were obtained per scan. Whole blood and plasma were counted in a cross-calibrated well-type gamma-counter (BSS-1, Shimadzu, Kyoto, Japan). An additional venous blood sample was taken before 11C-TMSX administration, which was used for the in vitro assessment of the fraction of 11C-TMSX in plasma bound to plasma proteins (fP). Arterial blood sampling was not available in one subject. Thus, a total of five subjects were included in reference region analyses and four subjects were also analyzed using plasma data. The fraction of intact radioligand to total plasma activity was determined from blood samples collected at 3, 10, 20, 30, 40, and 60 min after injection by high-performance liquid chromatography (HPLC). The blood was centrifuged at × 7,000 g for 1 min at 4°C to obtain the plasma, which was denatured with an equivalent volume of acetonitrile in an ice-water bath. The suspension was centrifuged under the same conditions and divided into soluble and precipitable fractions. The precipitate was resuspended in 2 vol. of 50% aqueous acetonitrile followed by centrifugation. The recovery yield of the radioactivity in the two soluble fractions was 98.7%. Two soluble fractions were combined, and into this solution, an equivalent volume of a solution of 50-mM aqueous acetic acid and 50-mM aqueous sodium acetate (pH 4.5; 50/50, v/v) was added. After centrifugation of the samples as described above, the supernatant was loaded onto a Nova-Pak C8 column equipped in an RCM 8 × 10 module (8 mm diameter × 100 mm length; Millipore-Waters, Milford, MA, USA). The mobile phase was a mixture of acetonitrile, 50-mM aqueous acetic acid and 50-mM aqueous sodium acetate (pH 4.5; 4/3/3, v/v/v) at a flow rate of 2 mL/min. The elution profile was detected with a radioactivity monitor (FLO-ONE 150TR; Packard Instrument, Meriden, CT, USA). The retention time of 11C-TMSX was 6.2 min. The recovery in the eluate of the injected radioactivity was essentially quantitative. The six measured parent fractions were fitted by a sum of exponential functions. The metabolite-corrected plasma curve was generated as the product of the total plasma activity and the fitted parent fraction curve. Individual fP values were determined by ultrafiltration. Prior to administration of 11C-TMSX, approximately 6 mL of blood was taken from each subject. A reference blood sample was created by adding 22.9 ± 15.7 MBq (at the time of administration, range: 10.1 to 49.5 MBq of 11C-TMSX in approximately 60 μL to this blood sample and incubated for 10 min at 37°C). Following centrifugation (2,000 g at room temperature for 3 min), triplicates of 400 μL aliquots of plasma sample were pipetted into ultrafiltration tubes (Microcon-30, 30 kDa, Merck Millipore, Billerica, MA, USA), and centrifuged at room temperature (14 min at 14,000 g). The free fraction fP was calculated as the ratio of activity in the ultrafiltrate to the total plasma. The amount of nonspecific binding of 11C-TMSX to the filter was also determined by applying the same procedure to a sample created by addition of 11C-TMSX to saline. Regions of interest were defined by manually drawing circles using the registered MR images as additional reference. The details are written in ,. Time-activity curves (TACs) were generated for eight ROIs: anterior putamen, posterior putamen, putamen, caudate head, thalamus, cerebellum, centrum semiovale, and cerebral cortex. The putamen ROI consists of the anterior and posterior putamen subregions. The cerebral cortex ROI included the frontal, temporal, and occipital cortices. In the present study, the cerebral cortex and centrum semiovale were chosen as candidate reference regions. For 11C-TMSX kinetic analysis, the cerebellum was not used as a reference region, because A2AR binding in our previous human study  was higher in the cerebellum than in neocortical regions. In a previous human autoradiographic study , the density of A2ARs in the frontal cortex was found to be low, as that in the temporal and occipital cortices. The DVR has been used in our previous study on an aging effect of A2AR in human brain ,. In this study, the two additional outcome measures, VT and BPND, were estimated. The definition of the outcome measures is described in . Regional TACs were analyzed using the Logan graphical analysis (LGA) with input function and reference tissue (two-parameter version) , to estimate the outcome parameters of VT and BPND. Starting time (t*) was set to 10 min post-injection . where BSMSS and WSMSS are the mean sum of squares between subjects and within subjects, respectively. In the test-retest study, an ICC value ranges from −1 (no reliability) to 1 (maximum reliability) ,. Sample sizes were calculated to detect a 20-percent difference in BPND between independent groups (two-tails t-test) using the software G*power 3.1 . The confidence level was set to be 5% (P < 0.05) and statistical power to 0.8. The mean of the test scans was used as the mean of baseline scans, and the SDs of the baseline and blocking scans were assumed to be same as the SDs of the test scans. All statistical parameters except for power analysis were calculated with MATLAB Version 7.12.0.635 (the MathWorks Inc., Natick, MA, USA) and Microsoft Excel 2010 (Microsoft, Redmond, WA, USA). Mean injected radioactivity and mean specific activity at the time of injection were 687 ± 73 MBq (range: 615 to 767 MBq) and 195 ± 80 GBq μmol−1 (range: 131 to 305 GBq μmol−1), respectively, for test scans (n = 5) and 731 ± 53 MBq (range: 690 to 822 MBq, n = 5) and 143 ± 60 GBq μmol−1 (range: 87 to 213 GBq μmol−1), respectively, for retest scans (n = 5). The injected dose and specific activity did not significantly differ between the test and retest scans (paired t-test, P = 0.21 for injected dose and P = 0.24 for specific activity). Figure 1A shows the averaged radioactivity in plasma with metabolite correction for test and retest scans (n = 4). The metabolism speed of 11C-TMSX was slow in both scans (Figure 1B): the unchanged fraction was still 85% ± 5% in test scan and 82% ± 6% in retest scan at 60 min post-injection. The free fraction of 11C-TMSX in plasma was 2.40% ± 0.96% for test scans and 2.40% ± 0.47% for retest scans. There are no significant differences in fP between test and retest scans (paired t-test, P = 0.72). The ultrafiltrate-to-saline ratio was 46% ± 3% in test scans and 46% ± 3% in retest scan, indicating a high retention on the filter. Mean ± SD of metabolite-corrected input function and unmetabolized 11 C-TMSX fraction. (A) Mean ± SD of metabolite-corrected input function for four healthy human subjects. The inserted graph corresponds to early data. The unit of plasma data was SUV [concentration/(injected dose/body weight)]. (B) Mean ± SD of unmetabolized 11C-TMSX fraction and mean of fitted curve for four healthy human subjects. The parent fraction was fitted using a sum of exponentials. Open and closed circles correspond to test and retest scans, respectively. Error bars show the standard deviation. Brain activity in all regions reached the peak around 5 min post-injection of 11C-TMSX, and then gradually decreased. The average tissue-to-plasma ratio was shown in Figure 2. Typical parametric images of BPND were displayed in Figure 3 using a centrum semiovale as a reference region. The ratios in most regions became constant around 20 min post-injection of 11C-TMSX. The ratios in the putamen were decreased slightly throughout the scan. The values for VT and BPND were summarized in Tables 1, 2, and 3. For each outcome parameter, the mean of the test and retest scans, the TRV (mean ± standard deviation), the aTRV, and the ICC were listed. For VT values, the mean TRV was smaller than 5%, and always smaller than its standard deviation, indicating that there is no systematic trend between test and retest scans. The absolute TRV was ≤10% except for the thalamus. The ICC values were moderate (>0.65) except for the thalamus (0.27). We also calculated the normalized VT (VT/fP). Global mean aTRV values were 8% and 15% for VT and VT/fP, respectively, indicating that normalizing by the plasma free fraction fp increased the variability of the outcome measure for 11C-TMSX. For BPND values, the mean TRV was between ±10% using either cerebral cortex or centrum semiovale as a reference region, and always smaller than its standard deviation, further indicating that there was no systematic trend between test and retest scans. Since BPND of the cerebellum from one subject was close to 0 in the test and retest scans with reference LGA with the cerebral cortex as a reference region, TRVs of the subject were different from the other subjects. Those values were removed from Table 2. Tissue-to-plasma ratio curve averaged across subjects ( n = 4) in six ROIs. ROIs are (A) putamen (diamonds), cerebellum (triangles), and cortex (circles) and (B) caudate head (diamonds), thalamus (triangles), and centrum semiovale (squares). Open symbols and closed symbols show test and retest scans, respectively. Error bars show the standard deviation. Typical example of parametric image for BP ND in (A) test and (B) retest conditions. The centrum semiovale was used as a reference region. The parametric image was fused with the individual subject’s MR image. aLogan graphical analysis with input function (t* = 10 min) (n = 4). Data are presented as mean (%COV); bTRV = (ptest − pretest)/(ptest + pretest) × 2, and aTRV is the absolute value of TRV; cICC = (BSMSS − WSMSS)/(BSMSS + WSMSS) where BSMSS is the mean sum of squares between subjects and WSMSS is the mean sum of squares within subjects. aData are presented as mean (%COV); bTRV = (ptest − pretest)/(ptest + pretest) × 2, and aTRV is the absolute value of TRV; cICC = (BSMSS − WSMSS)/(BSMSS + WSMSS) where BSMSS is the mean sum of squares between subjects and WSMSS is the mean sum of squares within subjects; dValues for the cerebellum were calculated from four subjects. aData are presented as mean (%COV); bTRV = (ptest − pretest)/(ptest + pretest) × 2, and aTRV is the absolute value of TRV; cICC = (BSMSS − WSMSS)/(BSMSS + WSMSS) where BSMSS is the mean sum of squares between subjects and WSMSS is the mean sum of squares within subjects. The mean BPND values were larger, and the TRV and aTRV were smaller when using the centrum semiovale as reference instead of the cerebral cortex. Global mean aTRV values were 8% and 15% for BPND using the centrum semiovale and cerebral cortex, respectively, as a reference region. Both TRVs using LGA with input function were comparable to those values using reference LGA. The BPND estimates using LGA with input function were in excellent agreement with those from reference LGA (BPND, reference LGA = 1.00 BPND, LGA + 0.01, R2 = 1.00 with the cerebral cortex as a reference region, BPND, reference LGA = 1.05 BPND, LGA + 0.01, R2 = 0.98 with the centrum semiovale). Power analysis (two-tails t-test, statistical power 0.8) was conducted to estimate the samples sizes to detect a 20-percent difference in BPND. Using the cerebral cortex as a reference region, sample sizes ranged from 4 (thalamus) to 21 (caudate head) per group. Using the centrum semiovale as a reference region reduced the required sample sizes: 3 (putamen and thalamus) to 9 (caudate head). The plasma free fraction (fP) was measured in this study, allowing for correction of VT values. This correction by fP is useful if fP can be measured reliably and if there is substantial intra-subject variation. In our measurements, the fP was consistently low (<3%), with evidence that 11C-TMSX stuck to the ultrafiltration tubes, which may lead to underestimation of fp. However, the fP value measured in  was 9.1% ± 0.4% (n = 6, human) by the ultrafiltration method. Such a discrepancy might be attributable to high stick factor in our data. Note that the stick factor was not reported in . Another possibility is the difference in the preparation of the injection solution. Finally, the signed and absolute TRVs were larger for VT/fP compared to those of VT. Hence, the normalization of VT by fP did not reduce variability in this case. Inter-subject variability (% coefficient of variation (COV)) of VT at retest scans were lower (approximately 7%) than that of the test scans (approximately 16%), while no significant difference was observed in the injected dose, specific activity, and fP of 11C-TMSX. Another possibility to explain the difference in the inter-subject variability is a difference in the metabolism of the tracer. The subjects were controlled for caffeine intake, but not for smoking habituations. Nicotine consumption might change the metabolism of 11C-TMSX as seen in the study with adenosine A1 receptor ligand 18 F-CPFPX . In a retrospective investigation, it turned out that subjects consisted of a nonsmoker, a smoker (blood sampling was not available), and three subjects with unknown status. However, the parent fraction of 11C-TMSX was very high and well reproducible (Figure 1B). Therefore, we concluded that a change in the metabolism speed was not a reason to increase the inter-subject variability. In contrast to VT, such a difference in the inter-subject variability did not exist in BPND. The difference in the %COV between test and retest scans might come from errors included in the input function measurement. The test-retest variability and reliability of VT were good (aTRV ≤10%, ICC >0.6) across regions except for the thalamus (aTRV: 13% and ICC: 0.27). For BPND, a good absolute TRV was seen in the high A2A regions (putamen and caudate). However, lower-binding regions (BPND < 0.4) showed high aTRV (>15%) and low ICC values; this is not surprising, since BPND is small in those regions. We examined the test-retest variability data of VT and BPND from a number of radioligands. The aTRV of VT of 11C-TMSX (8% averaged across all regions) was comparable to that of other radioligands used to study dopamine and adenosine receptors. The reported aTRV values of VT were 5% to 11% (average: 7%) with 11C-FLB457  for dopamine D2/3 receptor and 12% to 14% (average: 13%) with 18 F-CPFPX  for adenosine A1 receptor. The aTRV of BPND with 11C-TMSX was comparable to that with 11C-FLB457 (6% to 15%) and larger than that with 18 F-FPFPX (3% to 9%). Given the good reproducibility of VT, 11C-TMSX should be suitable for use in receptor occupancy studies with input function. The range of VT values was not wide across regions (0.70 to 1.46 mL/cm3). However, using the occupancy plot  is feasible using the regions with a narrow range of VT values with 11C-GSK931145 for glycine type 1 transporter (0.43 to 0.79 mL/cm3)  and 18 F-CPFPX for adenosine A1 receptor (0.42 to 0.82 mL/cm3) . Note that the occupancy plot assumes that the receptor occupancies are uniform in all regions of interest. Previous reports , suggest that some regions might have an ‘atypical’ binding. Therefore, we need to carefully choose regions used for the occupancy plot with 11C-TMSX. Another possible way for estimating receptor occupancy is to estimate a relationship between blocking dose (or plasma level) and VT for each region . This second method can be used even if all regions have the same baseline VT. The test-retest variability of BPND values using the cerebral cortex as a reference region was larger than those using the centrum semiovale. In the striatum, the high A2AR-binding region, the aTRVs of BPND were 5% in the putamen and 19% in the caudate head using the cerebral cortex as a reference region. On the other hand, the aTRVs of BPND were 3% in the putamen and 13% in the caudate head using the centrum semiovale as a reference region. This is partly because the BPND value was smaller using the cerebral cortex as a reference region. The thalamus showed a low reproducibility of both VT and BPND values. Moreover, while the mean distribution volume in the thalamus was high, a postmortem study with 3H-SCH58261  showed that A2AR density is low. The uptake in the thalamus is considered to be ‘atypical’ binding ,, which is different from classical A2AR binding. This low reproducibility in the thalamus may be partly due to such an ‘atypical’ binding. Thus, given the low reproducibility and ‘atypical’ binding, the thalamus should be carefully considered in further clinical research. Using either the cerebral cortex or centrum semiovale as a reference region, reference LGA and LGA with input function provided similar BPND values. The TRV and aTRV of BPND were slightly smaller using the reference LGA. Not surprisingly, the reference tissue model is not affected by errors in the measurement of input function. This suggests that the reference LGA can be useful for further studies. There are two limitations of this study: unknown optimal reference region for 11C-TMSX and small sample size. As far as we know, the only available A2AR blocking study using an antagonist radiotracer in vivo in human brain is a 11C-KW-6002 PET study with varying dose of cold KW-6002  However, blocking results in the centrum semiovale and neocortical regions were not included in the report. Thus, the suitability of the cerebral cortex or central semiovale as a reference region has yet to be determined by blocking or occupancy studies. Due to a lack of blocking study and postmortem study in the regions with low A2AR density, the region with lowest VT was chosen. For the SPECT A2AR tracer 123I-MNI-420, while a reference region is not yet validated, a test-retest reproducibility of BPND was evaluated to facilitate the comparison between 123I-MNI-420 and other A2AR radiotracers . We also took an exploratory approach to calculate BPND values using candidate reference regions in order to evaluate BPND reproducibility. However, the determination of the reference region is most desirable in order to establish the utility of 11C-TMSX for PET imaging. In this study, we evaluated outcome measures with input function in four subjects. We examined sample sizes for test-retest human studies using other radioligands. As far as we know, the minimum sample size is three subjects for test-retest protocol (18 F-MK-6577  for glycine transporter type 1 and 123I-MNI-420  for A2AR). 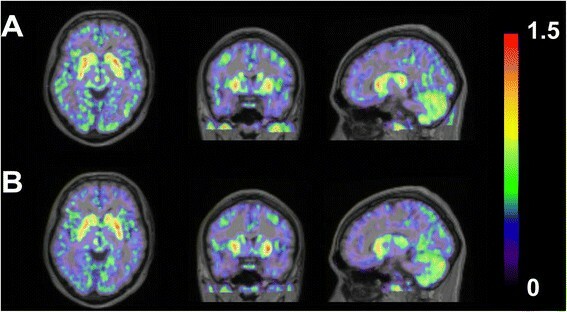 The quantification of 11C-TMSX imaging was reproducible for PET studies of A2AR. The LGA with input function achieved good reproducibility for VT in all regions. The results support the use of PET and 11C-TMSX as a suitable tool for receptor occupancy studies. The use of the cerebral cortex or centrum semiovale as a reference region with invasive and reference LGA produced good or moderate reproducibility of the BPND in high A2AR regions. While the centrum semiovale showed higher reproducibility of the BPND, blocking studies are required to determine the optimal reference region conclusively. The authors appreciate Dr. T. Oda for the production of 11C-TMSX and Ms. H. Tsukinari for caring for the subjects undergoing PET scanning at the Tokyo Metropolitan Institute of Gerontology. This work was funded by the Grants-in-Aid for Scientific Research (B) No. 16390348 and (B) No. 20390334 for K. Ishiwata and (C) No. 17590901, (C) No. 20591033, and (C) 23591287 for M. Mishina from the Japan Society for the Promotion of Science. Contributions to the conception of the study and its design were made by MN, MM, KIi, and KIa. The experiments were conducted by MM, MS, KO, MH, KIi, and KIa. MS was responsible for measuring plasma free fraction. KIa was responsible for tracer synthesis and metabolite analysis. MN performed the analysis and wrote the manuscript. MM, MS, KO, MH, KIi, and KIa helped in the discussions and drafting of the manuscript. All authors read and approved the final manuscripts.